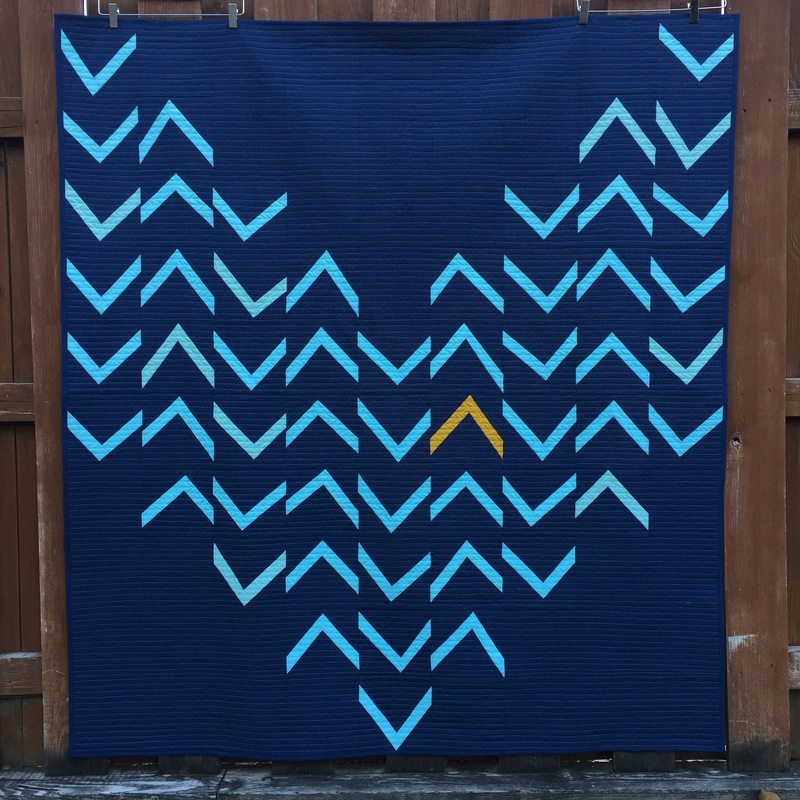 My quilt Rally is the free quilt pattern of the month for the Modern Quilt Guild! This is a really special position to have, not only since the MQG recently hit 10,000 members, but also because Quiltcon is literally right around the corner. It’s appropriate too, because Rally is about what it means to be a member of a group. It’s about individuality and uniqueness and belonging (or lack thereof) and courage. The blocks are each semi-improvised and completely unique. I used a ruler and rotary cutter, but no measurements when creating the angles. I encourage people who might follow the pattern to take a jump and try cutting with just scissors. The point is to take some baby steps toward improv quilting (the theme for guild charity quilts at Quiltcon is “Improv with Intent” and this follows that as well). For Rally, I used all Cirrus Solids from Cloud9 Fabrics on the top. The background fabric is Ocean, the angles are Sky and Rain, and the accent angle is Amber. I quilted with organic straight lines about 1/2″ apart in Aurifil #TKTK, Light Brass. And I really love the binding. It’s also Cirrus Ocean, and the tonal effect really makes it feel sophisticated to me. If you are an MQG member, check your email for a link to the free pattern on the community site. If you make the quilt and post online, tag it with #rallyqotm and me @melintheattic so I can see! Beautiful quilt, Melanie, and what wonderful timing for the quilt given its meaning! Congratulations! This is so lovely, Mel!! I’m going to check my email… I wonder if I could make a mini rally quilt? I very well might try if I can find time, precious time! Lovely contribution to the MQG. Congratulations, You Rock! I love your creativity. Congratulations Melanie! Amazing quilt! What an awesome achievement! I absolutely luv it! It just reached right out and grabbed me. I luv all the quilts being produced done in the modern way and designed by the person. Cannot wait to get my next edition of Quilt Con! Congratulations, Melanie! Rally totally deserves that special position of being chosen at this moment!! Love this quilt and I’m so happy with my pattern! I was so excited to see this in my inbox! It’s gorgeous, Melanie!! !